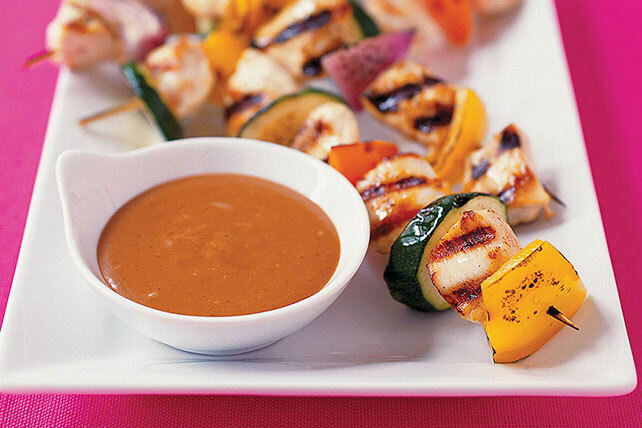 BBQ sauce and mayo make a quick and easy (and delicious) dipping sauce for these chicken kabobs. Thread chicken onto skewers alternately with the vegetables. Grill 6 to 8 min. or until chicken is done and vegetables are crisp-tender, turning frequently. Meanwhile, mix mayo and barbecue sauce until blended. Serve as a dip with the kabobs. Sassy Salsa: Mix 2 Tbsp. each KRAFT Light Mayo Reduced Fat Mayonnaise and TACO BELL® Thick & Chunky Salsa. Sweet & Sour: Mix 2 Tbsp. each KRAFT Sweet 'N Sour Sauce and KRAFT Light Mayo Reduced Fat Mayonnaise or MIRACLE WHIP Dressing.